The Redemptorists » Happy Neumann Year! Happy Neumann Year! Today the Redemptorists celebrate the feast of one of our brothers and great saints, John Neumann. Known to many as the fourth bishop of Philadelphia, the father of the parish school system in the United States, and the first male American saint, John Neumann was these things and so much more. Did you know he was an amateur botanist? Before he discerned a calling to the priesthood, Neumann thought he might enjoy the life of a scientist, maybe even a doctor. But God had bigger plans! All Neumann wanted to do as a priest was be a missionary, but once he arrived in the United States and began working with the German immigrants in upstate New York, he discovered how lonely such a life could be. The Redemptorists were the answer to his prayers — a community of missionary priests who supported each other while serving the needs of the people. He became the first Redemptorist to profess vows in the New World. Even after he became a bishop, Neumann retained many of his Redemptorist practices — he only owned one pair of shoes, and he often took his annual retreats with his Redemptorist brothers. He preferred the company of a simple farmer’s family to the high-society of Philadelphia. His great loves were the Blessed Sacrament (which led to his promotion of 40 Hours Devotions) and the rosary. For Neumann, the only thing that mattered in the end was God alone. The video below contains more about Neumann and his life. Enjoy and today, join us in thanking God for the gift of John Neumann. For more information about the Neumann Year and how you can celebrate, visit redemptorists.net/neumann. 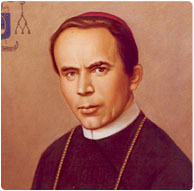 Loving God, the missionary spirit you gave St. John Neumann urged him to use his many gifts for your glory. He welcomed the immigrant, fostered love for the faith, and made Catholic education achievable for generations of students. As Bishop and Redemptorist, he promoted vocations to the religious life and priesthood. May his devotion to the Blessed Sacrament inspire us to bring you glory as we follow his powerful example with the gifts you have given us. God of all peoples and nations, continue to bless the Redemptorists and their ministries, and all who strive to serve you through Christ our Redeemer. Amen.